In the weeks following the "Six-Day War", in 1967 Israel a group of young kibbutzniks -- lead by author Amos Oz and editor Avraham Shapira -- recorded soldiers coming home from the battlefield. The result was a haunting set of tapes that were then partly censored (a good 70 percent of the interviews) by the Israeli Army and bound to be forgotten. A taped testament to what killing a fellow human being does to an individual, what the true "spoils of war" really are, was destined to be hidden away inside some archival vault, never to be heard again. Israeli filmmaker Mor Loushy has finally uncovered and revealed these recording in Censored Voices, a poignant and provocative documentary that I watched at this year's Middle East Now festival in Florence. Typically, I shy away from pointing out the nationality of a filmmaker, since I believe a great film is a worldly work of art. But in this case, I wanted to make a point that Loushy is indeed Israeli, shining the light on a moment in time that perhaps her country's politicians would like to leave forgotten. In a recent NY Times review of the film, the author there wondered if, in light of the Gaza attacks this past summer, Censored Voices could "become catnip for contemporary critics." Instead, in my humble opinion, I think that Loushy, her producer Hilla Medalia (Dancing in Jaffa, After the Storm) and of course, that pioneering of all filmmakers with a conscience, Eran Riklis (Zaytoun, The Syrian Bride, A Borrowed Identity) as well as other of their Israeli colleagues, are trying to change the perception of an apparently impossible situation by discovering the human stories beneath the headlines. And making great cinema in the process. If we consider watching a movie as our own active measure of standing up for what we wish and want from this world, if we listen instead of just hearing -- to paraphrase Loushy herself -- then Censored Voices becomes a movement to change the future, by finally learning from the past. It's a great beginning, since Censored Voices is scheduled to be released inside Israel, it has been traveling the world, and this week screens at Hot Docs in Toronto. Score one for the unifying power of cinema. A bit of background, a sort of abridged version of the "Six Day War," and why it could be important to understanding today's conflicts and allegiances. On June 5th, 1967, the war was started because both Egypt and Israel believed the other was readying for an attack. To the Arab world, then as today, Israel was seen as an illegitimate state and Egypt had received foreign intelligence pointing to an Israeli invasion. When all was said and done, on June 10th 1967, just a short but chaotic six days after the war started, Israel had not only conquered control of Gaza and the Sinai Peninsula from Egypt (the latter was later returned) but also annexed the West Bank and Jerusalem from Jordanian control. Along those borders is where most of the Jewish settlements were later built. This created a second Nakba ("disaster") for the Palestinians, less than 20 years after 1948. But incredibly enough, Loushy manages to steer clear of political statements and taking sides in her film, choosing instead to give the facts, through a set of recorded tapes made more than 40 years ago. Now onto the film itself. When I tell you that a film based on voice recordings and archival photography, interwoven with touching cinematic portraits of the soldiers today can indeed be a spellbinding masterpiece, believe me. 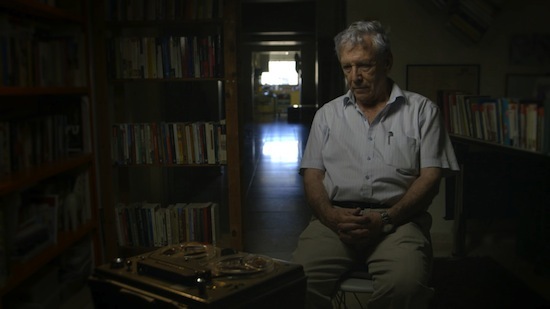 Amos Oz (pictured above, listening to the original recordings) is a voice to be reckoned with, pardon the pun, and his lived-in face opening the film captured my undivided attention immediately. I had a chance to spend a few precious moments with Loushy herself in Florence. She is a kind, pretty, soft-spoken woman who looks way younger than her thirty-two years. But beneath her lithe appearance, lies a force to be reckoned with, clearly. An old acting teacher of mine, Richard Pinter, always said it's the people who are unpredictable, those who don't show you all they are capable of right away, who are the most interesting. It applied to Loushy, who allows her cinematic prowess to speak for itself. Finally, as pieces go, this was one of the most complicated for me to wrap my head around. Part selfish wish for peace in the Middle East, part educational look into past history to apply its lessons to our dire-looking future, part personal journey into human feelings I never wanted to experience, Censored Voices unleashed a thoughtful, deeply moving moment in time. One I'll admit I can't wait to repeat, by watching this unforgettable film again, as soon as I can. 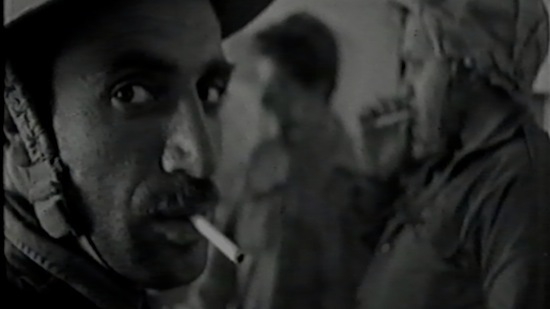 Images courtesy of the filmmakers, used with permission.